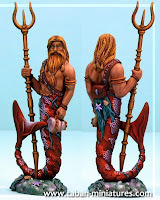 Nautica - for Warhammer fantasy battles: Vortex "the Water Shield"
Vortex is not of the Nautican race or akin to any of the sentient beings in the world. She may be the last known Ashray to occupy the deeps and is certainly the only one that can dwell, for short periods, upon the surface world under the gaze of it's sun. 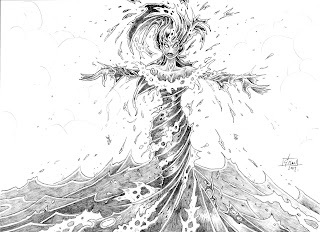 Vortex is wholly a water entity, she is translucent and those who have seen her up close have even noticed small fish swimming within her form. Her presence would be barely perceptible to the naked eye if it were not for the swirling water circling her body reflecting the dangerous light frequencies that could destroy her. When at peace and from a distance Vortex appears like a rainbow in the gloom of Nautican mists. When in battle Vortex summons a whirling mass of water around her and any unit she is with. The waters accelerate with terrifying speed, digging up the earth and rocks beneath it until it appears as a whirlpool capable of battering the life (or unlife !) from any enemy coming into contact with it. No one knows where Vortex comes from or where her purpose lay. The Nauticans believe her fate is interwoven with their own for good or ill and that is why she will appear, on occassion, to aid the Nauticans in their time of need. Vortex must accompany a unit of Wavebreakers or Trident guard, she can never leave the unit she started the battle with. If the unit fless or is detroyed Vortex instantly vanishes. The pace of the whirlpool gathers in speed and it's ferocity intensifies as enemies near. The full savagery of the seas are met upon the enemy's ranks as waters and detritus pound their bodies when they come into contact with Vortex or her unit. The whirlpool is incredibly difficult to control, even for Vortex. The waves of magic in the water ebb and flow in unpredictable ways meaning that a whirlpool that just tore the arm from a Varghulf may seconds later appear calm before once again smashing into the enemy. The following rules apply to every combat phase involving Vortex and/or her unit. 1) if the result is equal or less than Vortex's remaining wounds then the waters are under control. The result of this 2d6 dice roll also determines the number of automatic hits the enemy will suffer. 2) if the 2d6 roll is higher than Vortex's remaining wounds then she instantly vanishes, unable to control the waves of magic any longer. Vortex plays no further part in the battle and Victory Points are awarded to the enemy as though they had destroyed her with their own hands (or claws !). The unit which Vortex was a part of no longer benefits from the effect of any of the special abilities associated with Vortex. The vast torrent of waters circling Vortex and the unit she accompanies not only act as a shield but also make it dangerous and difficult for enemies to maneuver in combat and take advantage of flank and rear charges. The weight of enemy rank and file troops may continue to bear down upon the Nautican unit but due to the torrents of water obscuring their vision of the battlefield they are unaware whether they are outnumbered or not. As a result, the Nautican unit does not suffer the consequences that knowing they are outnumbered sometimes proffers. Enemies gain no combat resolution bonus for flank, rear attacks or outnumbering. Vortex's unit does not automatically flee when defeated by an enemy it fears that outnumbers it. Test like a normal break test against a feared enemy that does not outnmuber the Nautican unit. Vortex and her unit benefit from soft cover for enemy missile fire purposes.